It’s been far too long since I’ve indulged in the heady delights of Japanese splatter, so what better time to revisit such crazy, gore-filled antics than Halloween? Vampire Girl vs Frankenstein Girl is a pretty damn good one too, a total riot, packing in all the expected hideous and humurous goodness. The narrative is wacky and leaves ample screen time for the titular characters and other bizarre creatures to battle, as the blood rains. You want feet monsters, bone samurai, and re-animated nurses? You got it. This insane display of grotesque effects and silly story is brought to you by genre legend Yoshihiro Nishimura – Tokyo Gore Police, Mutant Girls Squad – and horror-erotica fiend Naoyuki Tomomatsu – Zombie Self-Defense Force, Lust of the Dead. 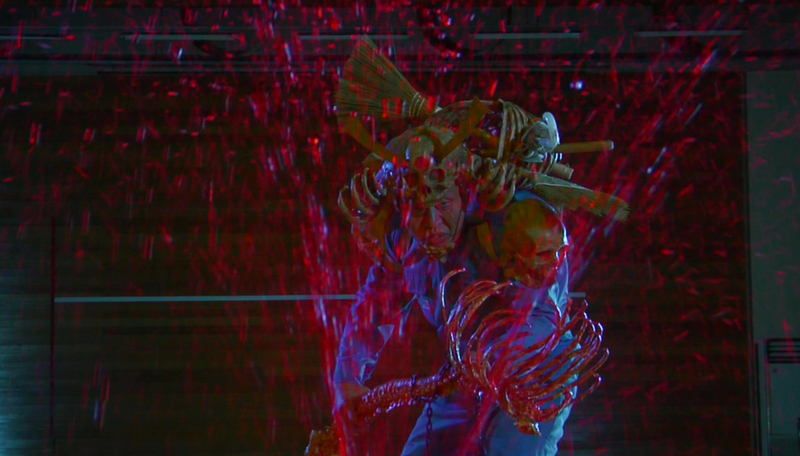 These experienced, if deranged, hands share the filmmaking load as co-directors, with Tomomatsu co-writing, and Nishimura editing and providing his infamous special effects. If you haven’t had an introduction to the style, it’s pretty well beyond comprehension. If you have, then rest assured that all the good stuff is here, from larger-than-life characters, to irreverent humour, and ridiculously spectacular deaths. It storms out of the gate with a cracker of a fight sequence too. Yes, the visuals of Vampire Girl vs Frankenstein Girl really are something to behold. Nishimura, with his self taught, low budget wizardry unleashes more of his unhinged creations on us, each one gnarlier than the last. Some of the creatures really do look fantastic, and some are suitably silly – he’s never one to let things get too serious, whether you’re talking about narrative or style. In that respect, Nishimura’s editing is pretty slick but unconventional, filled with jump cuts and anime-style character shots. He never misses an opportunity to inject a little psychedelia either, though the overly warm colourpass on daytime shots is an odd choice. I guess it’s meant to enhance the mood or something. In any case, the cartoon influence is everywhere, coming also from Tomomatsu, in the wacky stereotypes, the wacky acting, and the generally wacky situations. The stock sound effects slipped in regularly during gory fight sequences are a true guilty pleasure too. Fortunately for the directors, cinematographer Shu G Momose is well versed in capturing the insanity, from the soap opera silliness to the grotesque. After all, he got his start dealing with Nishimura’s disturbingly creative monsters on Meatball Machine. Kou Nakagawa is here as always, with an eclectic and amateurish soundtrack. Standing out are a couple of songs provided by other artists – Pinky Love by Trippi’s and Man Hunt by Tomohiro Odawara. They provide a seriously weird juxtaposition to the brutal action with incongruously happy, pseudo-retro style. You have to experience it. Loosely based on a manga by Shungicu Uchida, the story is at its core a dramatic love triangle. Fortunately it’s livened up by copious, off-the-wall humour and silly gore. Think Twilight, but good, and on acid. See, Gothic type Keiko, Elly Otoguro, is apparently into Jyugon, Takumi Saito. So too is the “unremarkable” exchange student Monami, Yukie Kawamura, who just happens to be a vampire. Problems arise when Monami gives Jyugon a blood-laced chocolate on Valentine’s Day, a thing girls do in Japan, at least without the blood. Not a bad custom I say. This causes him to transform into a vampire himself, and kind of pisses off the ever-pouty Keiko, who starts a rumble with Monami and promptly loses by falling to her death. If that sounds silly, wait, it only gets crazier. While Jyugon deals with his slow transformation, and his budding romance, Keiko’s dad, Kanji Tsuda of Ju-on, goes all Herbert West on his daughter’s corpse. There is a bit of an explanation given – told by him to the camera, no less – about being a deluded super-scientist who seeks to become a real life Dr Frankenstein. His assistant in this disturbing pursuit, for some unknown reason, is the hot school nurse, Midori, Sayaka Kametani. While the quirky romance drama continues, some amusing yet confusing sideplots develop. Namely, the rather scathing and uncomfortable, but utterly hilarious, depiction of class cliques – emo wrist-cutters and the “super-tanned club,” as well as a chain-smoking Chinese teacher. Don’t worry, it’s more of the duo’s unhinged humour, not pure racism. I think. It would appear Tomomatsu has some strong thoughts about the state of teenagers in Japan, though I’ve not read the manga to see if these bits of bizarre comedic relief were actually Uchida’s. In any case, what you may think is a stupid social commentary gag actually gets worked back in to the main plot, for no reason other than ‘they can.’ Back in the main story, things really come to a head when Keiko is reanimated as Frankenstein Girl, a freaky culmination of her father’s grotesque and deranged work, and some spare vampire blood. The fights sequences get more frequent and more spectacular as the directors build towards epic, concurrent climaxes. I feel like there’s another name for that. Anyway, one’s atop Tokyo Tower and one’s back at school with the aforementioned bone samurai. Yes he’s as cool as he sounds. Seriously, the effects on display here are top notch, though more creative and mind-boggling than technically brilliant. That said, for a low budget film in an industry like Japan’s, this is no mean feat. Nishimura’s uncanny affinity for creating the grotesque, and his ability to make it work within his movies is pretty amazing. Totally deranged too. But that’s precicely where the enjoyment lies, in Vampire Girl vs Frankenstein Girl and the subgenre as a whole. Narrative definitely comes in second to getting totally over-the-top stuff on screen, more of an enabler than a standalone element. Tomomatsu seems to have injected a bit extra into the plot, however, with some school days, slice of life stuff. In any case, these guys seem to know what they’re doing. Let’s just get to the next bit where someone’s face gets ripped off shall we? Speaking of which, from the very beginning they’re off with a bang. They open hard, with one of the best fight sequences of the movie, complete with cheesy, faux-60s pop song. It’s an exploitation symphony. That’s perhaps the best way to describe Vampire Girl vs Frankenstein Girl – an exploitation symphony, though that could be a tad too glowing. The movie isn’t without its faults, of course, occasionally things are too bizarre to process, and there are a few jokes that get partially lost in translation. However, for the vast majority of its sensible length, the movie is nothing short of awesome, hurtling along on shaky tracks, from one bizarre stop to the next. There’s a tonne of irreverent and bizarre humour on offer too, in the story and the action. Still, the main attraction is shock and gore, and that our directors deliver in bucket loads, while also managing to make a bit of sense. With a legend like Nishimura at the helm, it’s no surprise that the special effects are as brilliant as they are deranged. Couple that with some decent computer generated stuff, and you have a crazy horror that shines bright like a blood diamond. If you know what you’re in for, or even if you don’t, it’s a hell of a lot of fun. Just don’t forget that this is a ridiculously weird, and incredibly insane experience.